The current widespread interest in the hemostatic mechanism stems largely from the probability that its inappropriate function may lead to thrombosis, but also for its relevance to the causation and manage­ ment of bleeding disorders. Our understanding of the pathological events leading to thrombus formation or abnormal bleeding depends on knowledge of the basic physiology of the hemostatic system. A number of excellent multiauthor texts are available on the general area of hemostasis and thrombosis, and many symposia proceedings on specific topics in hemostasis have been published. The present volume aims to cover the normal function of hemostasis and ex­ plicitly excludes consideration of disease states and therapy. In addition, it is concerned with human hemostasis only although reference is made to studies on other mammalian species when the information supplements that available on man. The book is divided broadly into two sections. The first covers the current knowledge of the principal components contributing to the hemostatic process; the second examines the changes in these com­ ponents induced by physiological events, and details an accumula­ tion of information not previously brought together in a single text. 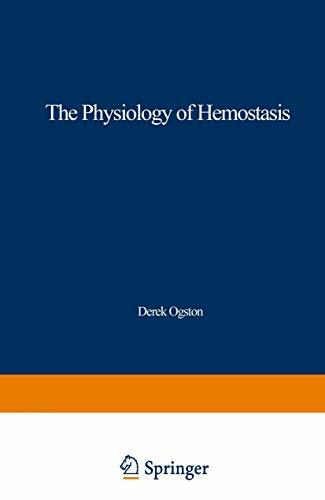 An introductory chapter, intended for the non-specialist, outlines the whole hemostatic process and provides an orientation for the later detailed information on individual components.